Moor Green Lakes has enjoyed a helping hand with colleagues from Xylem Water Solutions, who joined our Tuesday Volunteers to bravely negotiate the floating pontoon over to Long Island. I’m pleased that everyone negotiated the boating antics like the other Xylem team the week before at Hawley Meadows. The task was to clear riparian (water-side) birch and willow scrub to open up a scrape, which provides a sheltered shallow inlet for wading birds. 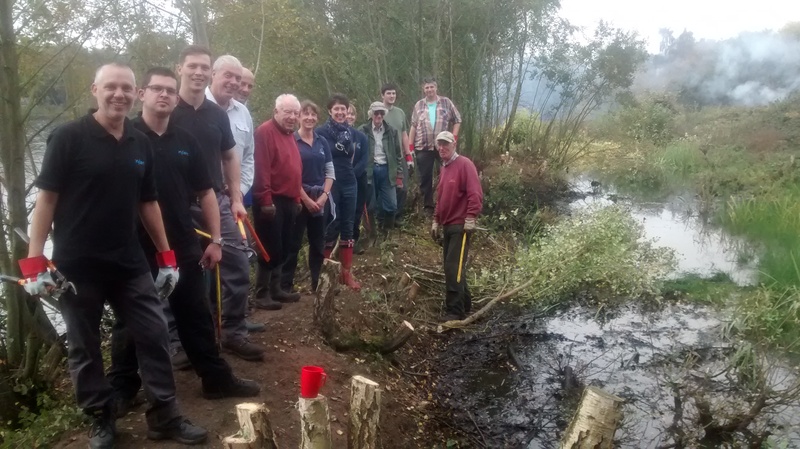 The volunteers worked well clearing the narrow earth bund which encloses the scrape, then processing the timber into log piles for invertebrates and brash to burn. We’ll return in a months time to finish off the last patch of tree felling to open up the scrape. 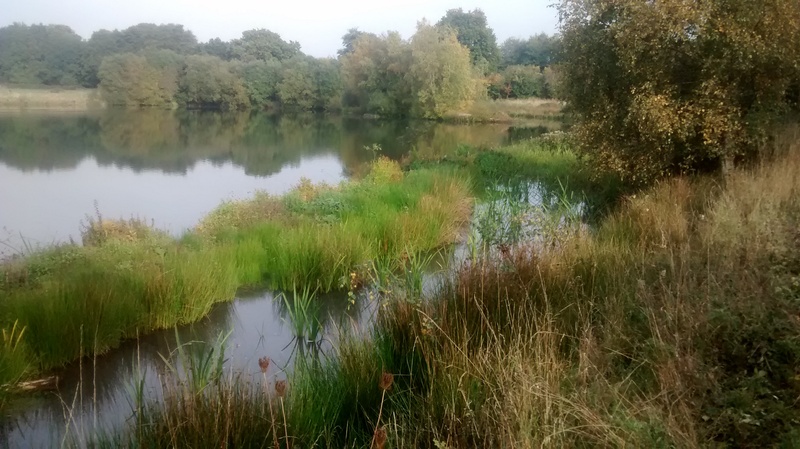 Once the bund is cleared it will be colonised by grasses and rushes to make a much more appealing area for our wading birds. I took a photo of another scrape we worked on a year ago, to demonstrate the dramatic effect the scrub clearance has. Thank you to all the volunteers for a really productive task. This entry was posted in Conservation, Moor Green Lakes, Volunteers and tagged Moor Green Lakes, Volunteers. Bookmark the permalink.